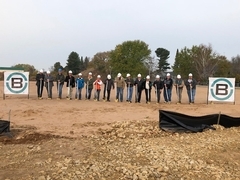 Shawano County broke ground for a new Human Services Building this month. The Boson Company is the General Contractor for the $8.6 million dollar office building. The new 2-story building totals 40,000 square feet of space for Adult, Youth, Aging, Income, Behavior Health and other County Services.